Szpidbaum’s rhetoric about Samaritan antiquity and pending extinction is representative of the concepts of group identities and their historical value in early twentieth-century physical anthropology, which were subsequently absorbed into the emerging field of human population genetics. Between Szpidbaum’s visit to Nablus and the establishment of the Israeli state in 1948, medical practitioners championed new molecular methods for human classification, relying on the frequencies of ABO blood types and the prevalence of inherited medical conditions. However, both the advocates of these new methods and those of traditional anthropometry agreed that specific human populations were particularly important and deserving of study: “living monuments” of the ancient Near East, such as the Samaritans in Palestine, Zoroastrians in Iran, Copts in Egypt, and Assyrians in Iraq, whose shrinking numbers were perceived to signal a total eclipse of the region’s biblical and pre-Islamic history. From the 1920s to the Human Genome Diversity Project, scientists have called for urgent projects of salvage genetics on such communities—sometimes in the name of aiding the groups’ recovery, but always in the name of rescuing history itself from anticipated oblivion. Here, I briefly trace how discourses of physical anthropology and, later, population genetics transformed Middle Eastern minority communities from relics of a religious past, representing an antiquated way of life, to valuable biological remnants of mythical origins. While focusing on the case of the Samaritans, I explore broader questions about how historically marginalized research subjects interact with representatives of the scientific community to create and reshape narratives of ethnogenesis as well as social practices like endogamy. How are these narratives of ancient populations, inscribed upon the bodies of living people, interpreted according to the contingencies of technology and nationalist politics? These local prejudices were not shared by the secular, socialist-inspired Labor Zionists who arrived in Palestine at the turn of the century. Generally, these settlers dismissed the dogma and practices of Orthodox Judaism and were eager to find local allies in the project of building the modern Jewish state. It was under these circumstances that several Jewish anthropologists and physicians like Szpidbaum, Samuel Weissenberg, and Rina Younovitch presented their data on anthropometric measurements and blood type frequencies as supporting Samaritan ancestry claims (Weissenberg 1933; Younovitch 1933). Their work provided a scientific basis on which to accept the Samaritans’ account of their origins, dramatically revising the traditionally hostile Samaritan-Jewish relationship. Armed with these calculations about the community’s bones and blood, a number of influential Labor Zionists portrayed the Samaritans as the indigenous Palestinian kin to the Ashkenazi Jewish settlers returning from exile. Perhaps the most significant of these figures was Yitzhak Ben-Zvi, a Russian-Jewish historian and future president of Israel (between 1952-63). Around 1907, Ben-Zvi moved in with a Samaritan family—the Tsedakas, who had relocated from Nablus to Jaffa—while conducting research on Samaritan history and traditions. Ben-Zvi was instrumental in convincing the Tsedaka paterfamilias to allow his sons to marry Jewish immigrant women. Out of five such intermarriages arranged between the 1920s and 30s, three were successful and played a key role in the Samaritan community’s demographic recovery. Ben-Zvi soon became a prominent advocate for the community as a whole, seeking to grant the Samaritans Israeli citizenship rights. Although the Law of Return only stipulated that Jews would attain citizenship after immigrating to Israel, Ben-Zvi argued that Samaritans should also be eligible on the grounds that in “racial” terms, they were Israelites. In the early 1950s, he orchestrated the creation of a Samaritan neighborhood within the city of Holon (near Tel-Aviv) and encouraged the migration of more Samaritan families out of Nablus (then within Jordanian territory) into Israeli state borders (Schreiber 2014). 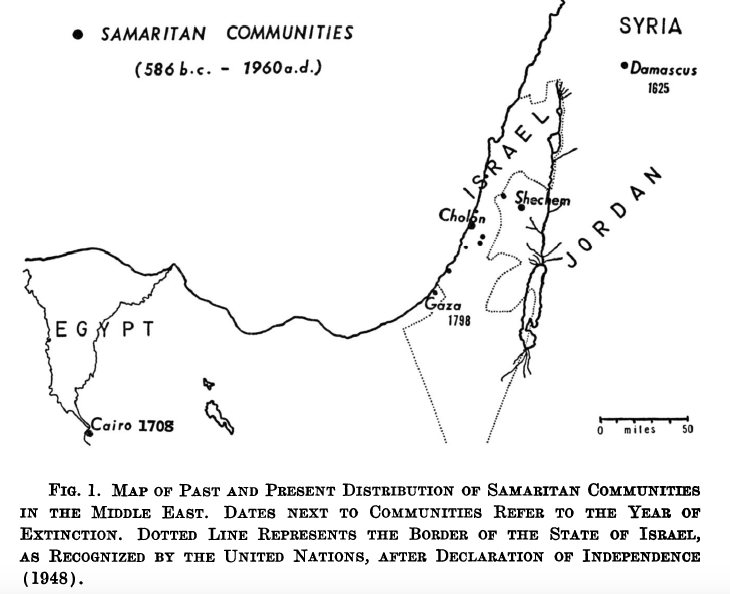 By the early 1960s, less than 30 years after Szpidbaum’s report, the overall Samaritan population had more than doubled, with about 150 living in Holon and about 200 in Nablus. Yet while the fresh blood of new members and the generally positive relationship with Israel seemed to bode well for the community’s survival, a rising generation of scientists—both Israeli and Anglo-American—posed additional concerns about the Samaritan past and future. In their eyes, Ben-Zvi’s policies of integrating Samaritans into Israeli society threatened both the legitimacy of Jewish nationalism and the Samaritans’ biological uniqueness. 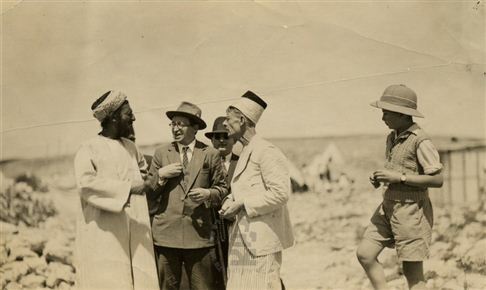 Chaim Sheba, the influential Israeli physician and sometime director of the Ministry of Health, challenged the notion that the Samaritans descended from an autochthonous Judaean population at all. For Sheba, who came from an Orthodox Jewish family, the stakes involved in the Samaritans’ genetic identity were at once religious and political: the efforts of his fellow Labor Zionists to rehabilitate the Samaritans as native Israelites undermined the primacy of the biblical accounts of Jewish history that they used to justify their claims to Palestinian land. During the 1950s and 1960s, Sheba committed himself to using genetic data—specifically, the incidence rates of hereditary diseases—to reconstruct the migration patterns of the Jewish Diaspora according to biblical narratives. Ultimately, he argued that because the Samaritans lacked the gene for an enzyme deficiency common among Middle Eastern Jewish communities, genetics confirmed the writings of rabbinical Judaism that claimed the Samaritans actually belonged to “a foreign stock brought over by the Assyrians” (Sheba et al. 1962). Not Samaritans, but only Jews themselves, he contended, embodied the remnants of the ancient Judaean gene pool. Meanwhile, American geneticist Leslie C. Dunn (1963) of Columbia University expressed fears that “out-marriage would shortly terminate [the Samaritan community’s] existence as a biological entity.” In other words, even if the Samaritan community gained members through occasional marriages with Jewish women, whose children and grandchildren in turn benefited from the reduced incidence of genetic diseases, they still faced another kind of extinction by introducing foreign elements into the ancient Hebrew gene pool so diligently preserved by their ancestors. For Dunn and like-minded members of the international scientific community, the healthy new generation of Samaritans represented the community’s declining value for biological and historical research. A young Israeli genetic anthropologist, Batsheva Bonné, soon countered these concerns and reoriented the scientific conversation about the Samaritans’ biological identity to account for the community’s own interests. In 1960, Bonné established a correspondence with Yisra’el Tsedaka: the nephew of Yefet Tsedaka, the community’s de facto leader in Holon. Using the information he supplied about Samaritan family genealogies, she recorded a comprehensive demographic survey of the Holon Samaritans for her master’s thesis at the University of Chicago. Her earliest publication from the thesis echoed Sheba’s promotion of the rabbinical Jewish biblical interpretation that the Samaritans descended from “settlers who were transplanted into Palestine” (Bonné 1963). However, in her subsequent doctoral work on the blood-type genetics of the Samaritans, she came to favor the narrative of shared Jewish-Samaritan origins, attributing Samaritans’ genetic difference from Jews to their long reproductive isolation and the effects of endogamy. This shift in representation is certainly related to the long-term relationship she cultivated with the community, involving weekly visits to their neighborhood in Holon. She portrays this relationship as one of mutual respect and appreciation, as opposed to other researchers’ more exploitative approaches to collecting Samaritan blood from the community in Nablus (Burton 2018). In her autobiography, Bonné writes that her presence among the Samaritans “was not that of an anthropologist-scientist with a foreign tribe whose customs and traditions are anchored in another world.” Rather, she claimed, her personal friendships with the Tsedakas and other Samaritan families enabled the discussion of delicate medical information (Bonné-Tamir 2010). In 1966, Bonné published two articles on her doctoral work (one provocatively entitled “Are There Hebrews Left?”), which directly addressed both the conflicting accounts of Samaritan origins and the genetic effects of their recent marriages with Jewish women. She took pains to clarify that these out-marriages had been confined to a single family lineage (namely that of her close friends, the Tsedakas) and argued that the preponderance of genetic evidence supported the Samaritans’ claims of centuries of reproductive isolation (Bonné 1966b). In a challenge to her mentor Sheba, Bonné wrote: “Whether present gene frequencies are related or unrelated to those of many generations—a fact we cannot know—the Samaritans represent a descendant population from the old Hebrew kingdom; not of the total Israelite kingdom but of a small branch of it, as indeed they claim.” Still, she chided both the various geneticists with whom she collaborated as well as previous scholarship for their obsessive reliance on the Samaritans to reconstruct an ancient Judaean gene pool, arguing: “In itself, the usefulness of concluding that the Samaritans are the living representatives of ancient Hebrews, is doubtful” (Bonné 1966a). Bonné instead promoted studies of the medical genetics of the Samaritans, whose small community and endogamous marriage practices had produced high rates of inherited disorders. With the help of the Tsedakas, she initiated a program of premarital genetic counseling (still extant today) for young Samaritans in the hope of reducing the prevalence of these disorders, which has successfully induced the community to consider genetic problems in its matchmaking practices (Schreiber 2014). However, she acknowledged that the Samaritans themselves were interested not only in medical aid, but also in the capacity of genetic information to reinforce the community’s claims of shared ancestry with Jews. For example, she described the response of Yefet Tsedaka, the Holon Samaritans’ leader, to Sheba’s research on the G6PD enzyme deficiency, a maternally inherited disorder common among Middle Eastern Jews but absent among Ashkenazim and Samaritans. Whereas Sheba had declared this evidence that Samaritans were not descended from the Israelite tribes, Tsedaka reinterpreted Sheba’s data in a manner consonant with the community’s beliefs. He explained to Bonné that the Samaritans belong to the tribe of Ephraim while the Ashkenazim descend from the tribe of Benjamin—namely, the descendants of the biblical matriarch Rachel. He deduced that Rachel must not have possessed the gene for the enzyme deficiency, whereas the other wives of Jacob did and passed it down to their descendants among the Jewish population (Bonné 1966a). The potential of scientific epistemology to overcome rabbinical prejudices has perhaps influenced Samaritans’ continued cooperation with Israeli and foreign geneticists in the era of DNA sequencing. While Bonné’s publications on the Samaritans, as recently as 2003, explicitly avoid the question of community origins, an independent collaborative group of American and Israeli geneticists sequenced Samaritan mitochondrial and Y-chromosome DNA with the professed aim of re-testing the rabbinical Jewish and Samaritan narratives (Bonné-Tamir et al. 2003). Ultimately, these studies also claimed to support a shared ancestry for Jews and Samaritans predating the Assyrian conquest (Shen et al. 2004; Oefner et al. 2013). Samaritans therefore have reason to look favorably upon genetic research, given that they still face discrimination and occasionally outright harassment from Orthodox Jews in both Israel and the West Bank (Schreiber 2014; Droeber 2014). Like other marginalized Middle Eastern minorities, Samaritans responded to the social and scientific co-production of ethnic nationalism and physical anthropology by reconceptualizing their histories in terms of the maintenance of not only religious but also ethnic, i.e. biological, purity. In many cases, the scientific attention that has imagined these groups as the living repositories of ancient gene pools has also offered affirmation of their ancestry claims, securing their faith in and cooperation with genetic research. Yet while these discourses have reinforced a conflation of biological ancestry and endogamy with community history and identity, the rate of outmarriage among the Samaritans is actually increasing. In fact, they now embrace the practice for the express purpose of decreasing the incidence of genetic diseases in the community, which genetic counseling alone could not achieve. With this “eugenic” justification, Samaritan men (though not women) have been permitted to marry not only Israeli Jews, but also Christian wives imported from Ukraine. The Samaritan understanding of genetics and its significance to community health as well as ethnonationalist politics evidently allows them to represent “living monuments” on their own terms. Having “proved” the authenticity of their origins and attained important political privileges from the Israeli state, Samaritans have consciously chosen to transform their gene pool to ensure the community’s continued growth and survival. Bonné, Batsheva.1963. “The Samaritans: A Demographic Study.” Human Biology 35 (1): 61–89. ———. 1966a. “Are There Hebrews Left?” American Journal of Physical Anthropology 24 (2): 135-145. ———. 1966b. “Genes and Phenotypes in the Samaritan Isolate.” American Journal of Physical Anthropology 24 (1): 1-19. Bonné-Tamir, Batsheva. 2010. Ḥayim ʻim ha-genim: ḥamishim shenot meḥḳar ba-geneṭiḳah shel ʻedot Yiśraʼel. Yerushalayim: Karmel. Bonné-Tamir, Batsheva, et al. 2003. “Maternal and Paternal Lineages of the Samaritan Isolate: Mutation Rates and Time to Most Recent Common Male Ancestor.” Annals of Human Genetics 67 (2): 153–164. Burton, Elise K. 2018. “‘Essential Collaborators’: Locating Middle Eastern Geneticists in the Global Scientific Infrastructure, 1950s–1970s.” Comparative Studies in Society and History 60(1): 119-149. Droeber, Julia. 2014. The Dynamics of Coexistence in the Middle East: Negotiating Boundaries between Christians, Muslims, Jews and Samaritans. London: I. B. Tauris Publishers. Dunn, Leslie. 1953. Letter to Arthur Mourant. 2 October. Arthur E. Mourant Papers, PP/AEM/K.21:Box 29, Wellcome Library, London. Huxley, Henry Minor. 1906. “Samaritans.” Jewish Encyclopedia. Peter J. Oefner et al. 2013. “Genetics and the History of the Samaritans: Y-Chromosomal Microsatellites and Genetic Affinity between Samaritans and Cohanim.” Human Biology 85(6): 825–57. Schreiber, Monika. 2014. The Comfort of Kin: Samaritan Community, Kinship, and Marriage. Leiden: Brill Publishers. Sheba, Chaim et al. 1962. “Epidemiologic Surveys of Deleterious Genes in Different Population Groups in Israel.” American Journal of Public Health 52 (7): 1101–1106. Szpidbaum, Henryk. 1927. “Die Samaritaner: anthropobiologische Studien.” Mitteilungen der Anthropologischen Gesellschaft in Wien 57 (5/6): 139-158. The New Samaritans. 2007. Directed By Sergei Grankin et al. Surrey, United Kingdom: Journeyman Pictures. Weissenberg, Samuel. 1909. “Die autochthone Bevölkerung Palästinas in anthropologischer Beziehung.” Zeitschrift für Demographie und statistik der Juden 5: 129–139. Younovitch, Rina. 1933. “Etude sérologique des juifs samaritains.” Comptes rendus des seances de la Societe de Biologie 85 (112): 970–971. The mentioned condition is glucose-6-phosphate dehydrogenase (G6PD) deficiency, which causes favism in individuals with Mediterranean ancestry. Samaritans in Nablus also face suspicion from their Muslim and Christian Palestinian neighbors, who consider them to be “Jews” in light of their entitlement to Israeli citizenship. See Chapter 8 in Schreiber, The Comfort of Kin. The somewhat sensationalized experience of some of these wives adjusting to the religious restrictions of Samaritan life is portrayed in the documentary “The New Samaritans” (Journeyman, 2007). Elise K. Burton, “Living Monuments: Imagining Ancient Gene Pools in the Middle East,” History of Anthropology Newsletter 42 (2018): http://histanthro.org/notes/living-monuments/.